Posted on Dark Faerie Tales.In the second book of The Assassin’s Curse series, Clarke does not disappoint with The Pirate’s Wish. She has brought me back to this world of wonder and amazement. I discovered Clarke on a random browsing of a catalogue. The cover intrigued me and I decided that I had to read it. I’m glad I did because Clarke has become one of my favorite authors. The Pirate’s Wish is a wonderful sequel, filled with magic, danger, and a journey worth remembering.Ananna and Naji have found themselves on an enchanted island. They have sought out to break the impossible curse that binds them together. It has been a journey of careful planning and silent voyages. Up until this book, Naji and Ananna have unseen dangers. Naji has enemies that are yet to be seen and Ananna has the impending wrath of the Pirate Confederation. With the help of an unexpected friend, and a surprising help of another, they travel long and far to break the impossible curse. The only cure is three impossible feats. Filled with much more danger than the last book, The Pirate’s Wish is something to behold.Ananna is a wonderful heroine. Who wouldn’t love a pirate, bonded to an assassin and running away from the confederation? She isn’t as reserved as the previous book, and I want to say that we see more emotion from her. Whether it be emotions of anger, anguish, or love, Ananna isn’t afraid to show the read what she feels. But to now share with Naji? That’s a whole different story completely. Ananna has a sense of martyr-dom that she feels she needs to take on. She sacrifices certain things, takes actions on others to improve their situation. There are consequences, but Ananna does it all with the best intentions. I love her. Her voice is clear and distinct. She draws you in and you want to become her, curse or not. Naji is adorable. What assassin can you really describe that way? 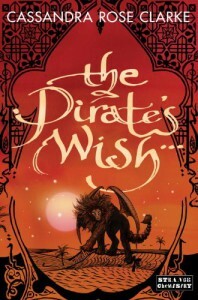 In The Pirate’s Wish, I read more about Naji’s world, his past, and about his secretive world. It was interesting. He has so many great intentions, but he’s an assassin who should be void of emotions. The translations don’t come out clearly, but Clarke has definitely showcased who he is as a person. Clarke’s world has evolved, adding in more magical and fantasy elements. She has brought the reader away from the island and to another place completely. Despite it be in the ocean or on a floating island, there are so many details that add to imagining it all. The descriptions allow for vivid imagination, bring all the strength of adventure and pizazz. There’s a little bit more romance and camaraderie in The Pirate’s Wish. I loved it. It was really enjoyable to see two people become something more. It adds this element that you weren’t sure if you were waiting for it or surprised by it. It’s tender and filled with tension. The angst fans will definitely love it. The pacing of Clarke’s writing adds to the thrill, perfect from once scene to another. I really, really enjoyed The Pirate’s Wish. Wait until you meet the manticore and other surprise guests. I highly urge you to read Clarke’s stories. Pirates, assassins, magic, and the seven seas!